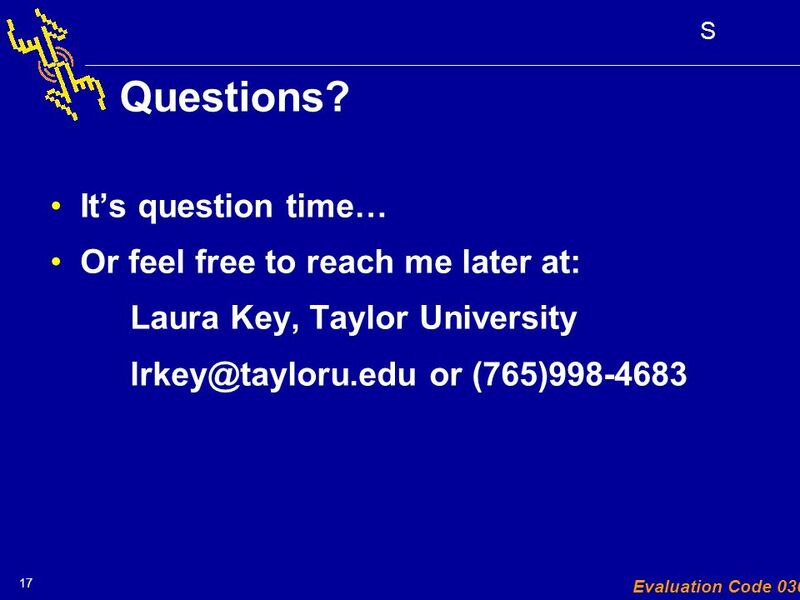 S the of partnership power Evaluation Code 030 Presenter: Laura Key, Taylor University Monday, April 9th - 8:30 AM Building a Self- Refreshing MS Access. 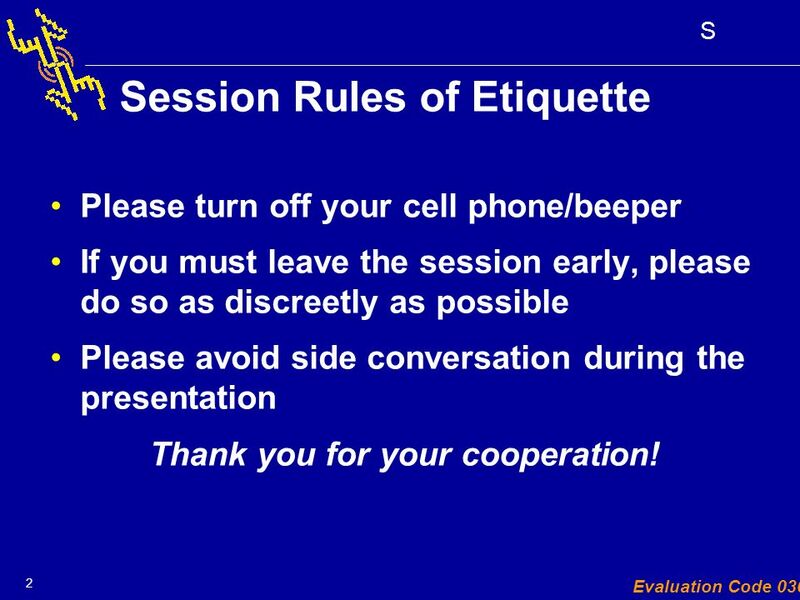 2 2 S Evaluation Code 030 Session Rules of Etiquette Please turn off your cell phone/beeper If you must leave the session early, please do so as discreetly as possible Please avoid side conversation during the presentation Thank you for your cooperation! 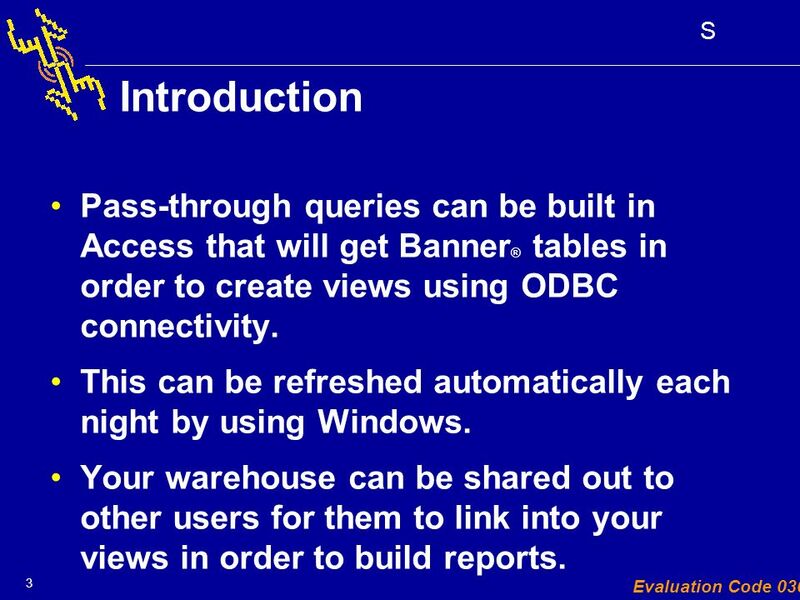 3 3 S Evaluation Code 030 Introduction Pass-through queries can be built in Access that will get Banner ® tables in order to create views using ODBC connectivity. This can be refreshed automatically each night by using Windows. Your warehouse can be shared out to other users for them to link into your views in order to build reports. 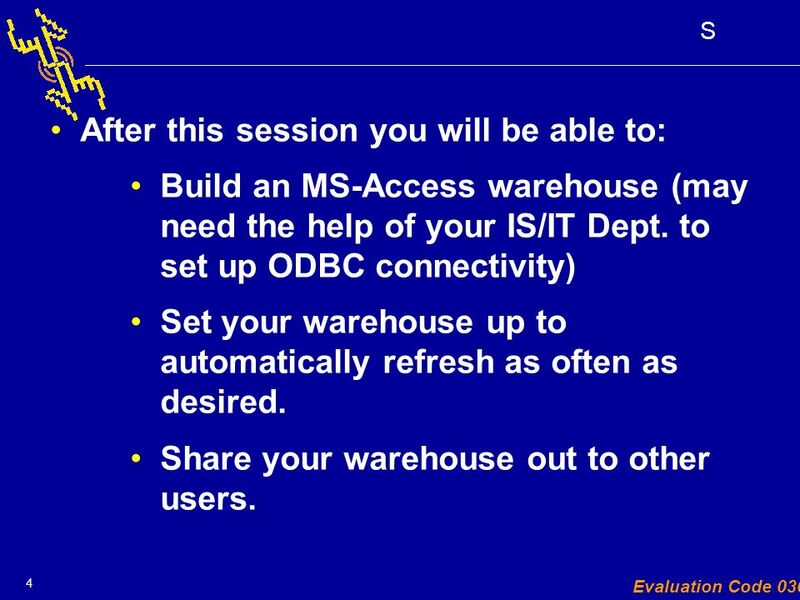 4 4 S Evaluation Code 030 After this session you will be able to: Build an MS-Access warehouse (may need the help of your IS/IT Dept. to set up ODBC connectivity) Set your warehouse up to automatically refresh as often as desired. Share your warehouse out to other users. 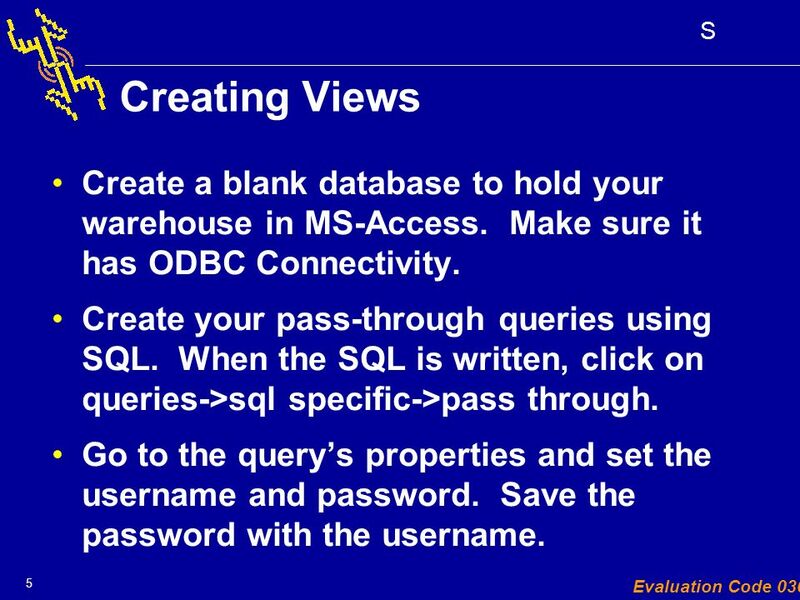 5 5 S Evaluation Code 030 Creating Views Create a blank database to hold your warehouse in MS-Access. Make sure it has ODBC Connectivity. Create your pass-through queries using SQL. When the SQL is written, click on queries->sql specific->pass through. Go to the querys properties and set the username and password. Save the password with the username. 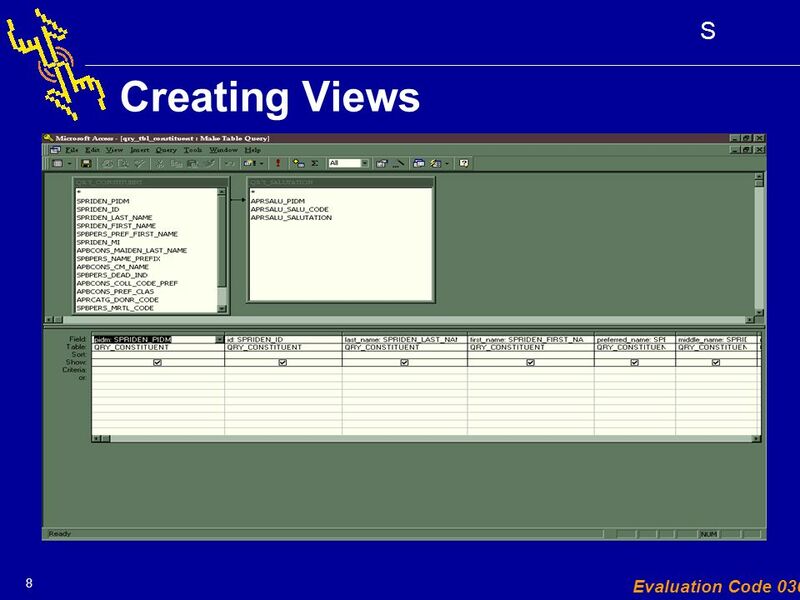 7 7 S Evaluation Code 030 Creating views The first query you create is just a select query to get the data that is desired for the view. Save this query. 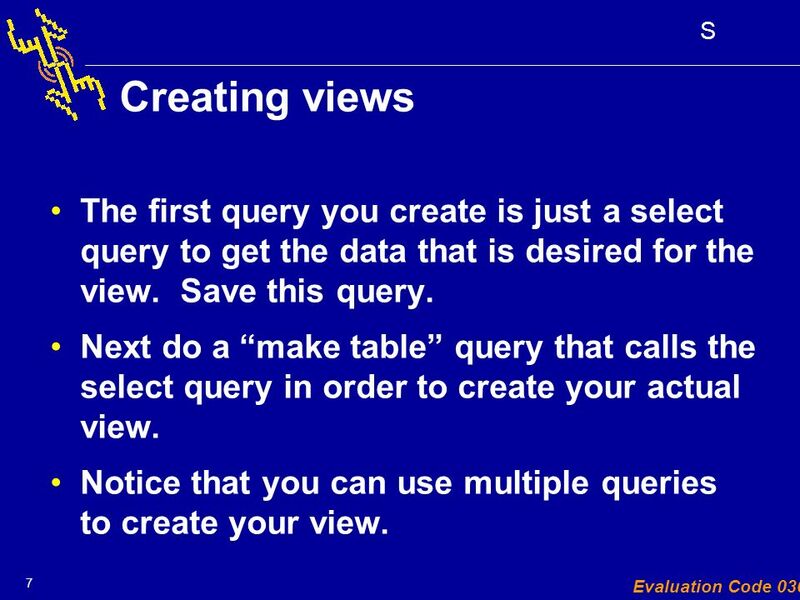 Next do a make table query that calls the select query in order to create your actual view. 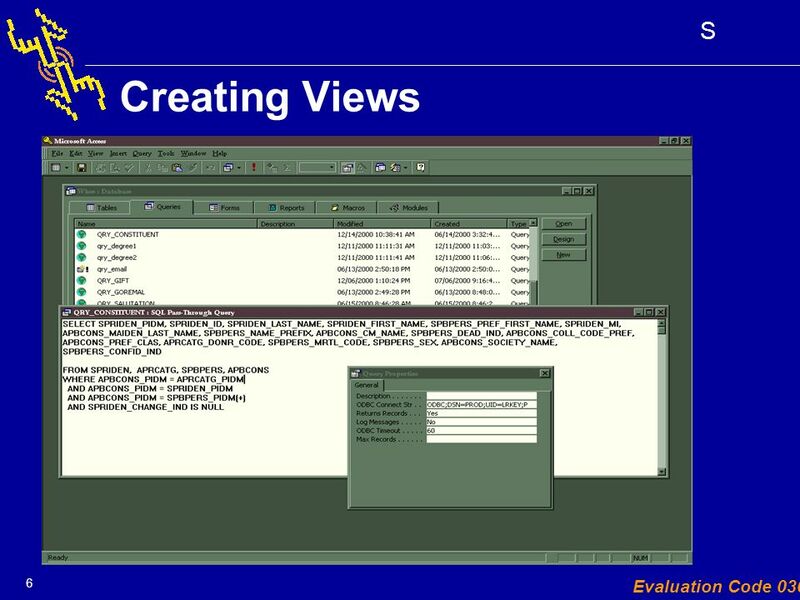 Notice that you can use multiple queries to create your view. 9 9 S Evaluation Code 030 Building a Macro After you have your select and make-table queries built and tested, you need to create a macro that will fire them off. 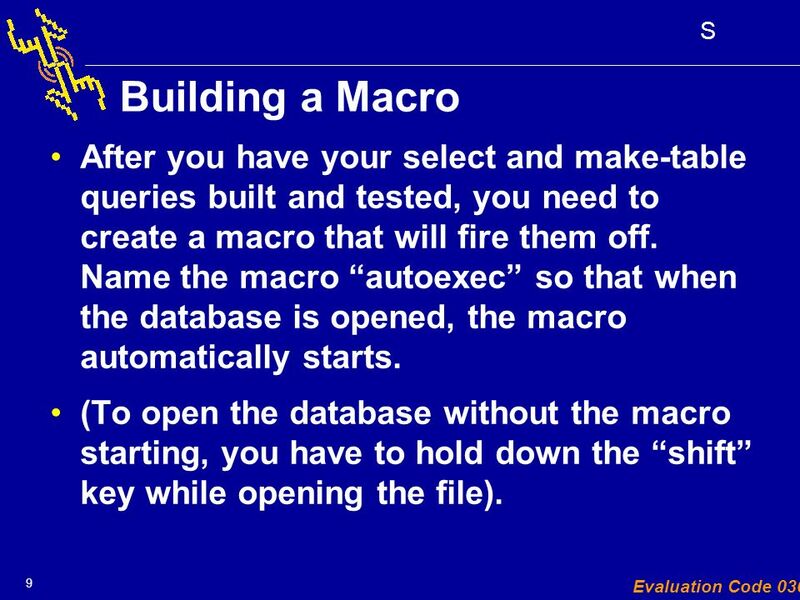 Name the macro autoexec so that when the database is opened, the macro automatically starts. (To open the database without the macro starting, you have to hold down the shift key while opening the file). 10 10 S Evaluation Code 030 Steps within the Macro First I turned of the warning messages. Then I opened the make-table queries. Then I exported the finished tables to another database that I shared out (did not share the actual warehouse so no one could access my passwords, queries, etc). This can be on a shared drive, etc. 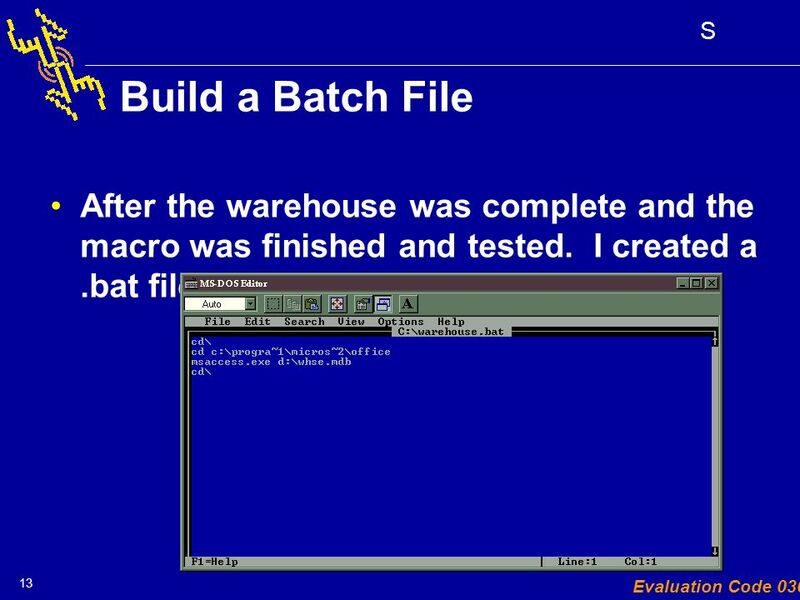 13 13 S Evaluation Code 030 Build a Batch File After the warehouse was complete and the macro was finished and tested. I created a.bat file. 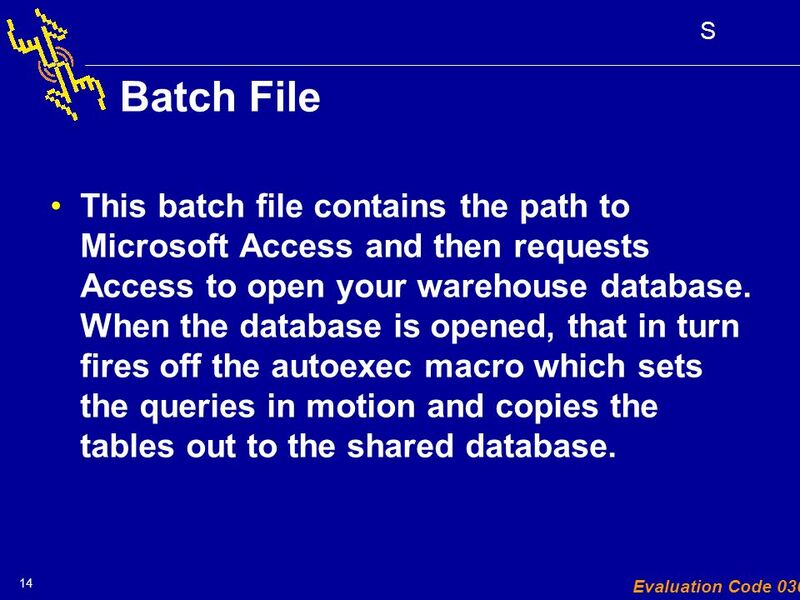 14 14 S Evaluation Code 030 Batch File This batch file contains the path to Microsoft Access and then requests Access to open your warehouse database. 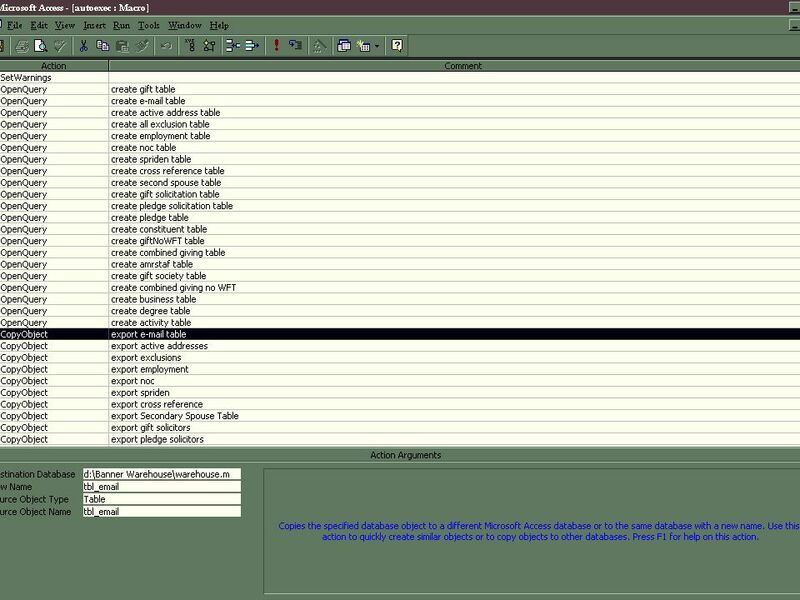 When the database is opened, that in turn fires off the autoexec macro which sets the queries in motion and copies the tables out to the shared database. 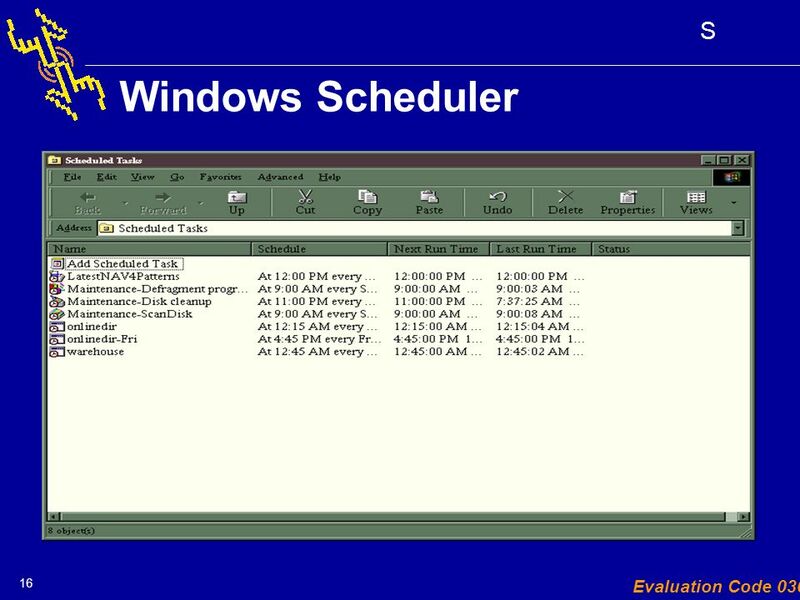 15 15 S Evaluation Code 030 Starting the Batch File The batch file is started using the task scheduler utility in Windows. This comes with Windows 98 and can be added to Windows 95 using the latest version of Internet Explorer. 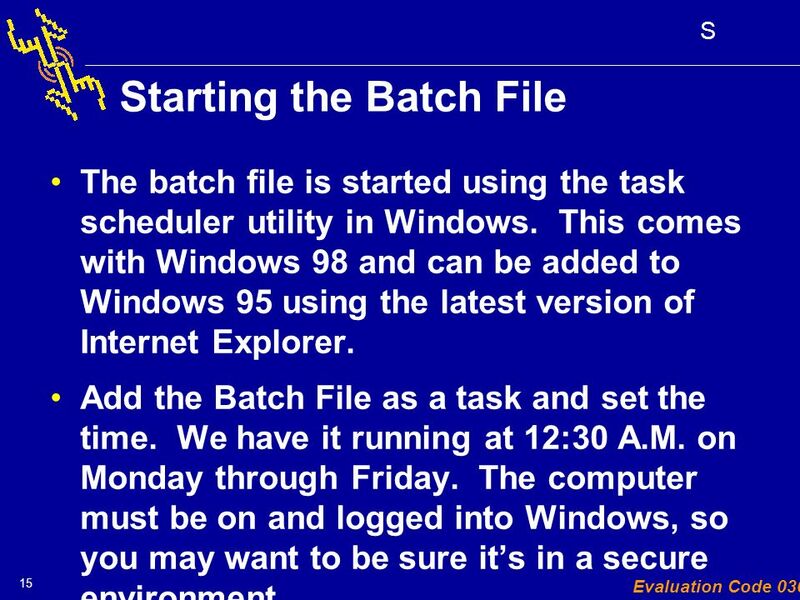 Add the Batch File as a task and set the time. We have it running at 12:30 A.M. on Monday through Friday. The computer must be on and logged into Windows, so you may want to be sure its in a secure environment. Download ppt "S the of partnership power Evaluation Code 030 Presenter: Laura Key, Taylor University Monday, April 9th - 8:30 AM Building a Self- Refreshing MS Access." More Pass-Through Queries! Evaluation Code 245 Dan DeBower Technical Consultant SCT Tuesday, March 26 th, :00am – 9:30am. 1 All Powder Board and Ski Microsoft Access Workbook Chapter 10: Database Administration Jerry Post Copyright © 2007. Online Access to Student Information "The primary goal of the Cleveland Metropolitan School District is to become a premier school district in the United. Pennsylvania Banner Users Group 2008 Fall Conference Spreadsheet Budgeting. SCT Banner ® Advancement Self-Service Gerald A. Lennon Lehigh University Session Date and Time Tue, October 28, :45am-12:15pm. Pennsylvania Banner Users Group 2008 Fall Conference IUP Enrollment Management Solutions Jeff Montgomery. Health and Work Development Unit How to use the online data collection tool If you require any further assistance, please contact the HWDU audit helpdesk.